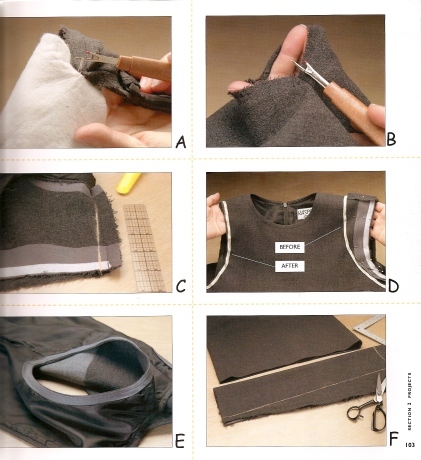 Altered Clothing features two-dozen step-by-step guides to transforming a blah article of clothing into an eye-catching piece. It also includes a survey of how and where to find inspiration for diy fashion projects. The "blah" items are pretty universal, such as worn-out jeans, a stained white skirt, a poncho, a baggy hockey jacket, and so on. Even if you don't have the items in question, seeing how to alter them makes interesting reading––and viewing, since there are plenty of diagrams for those who are more visual learners. I would not recommend this book for absolute beginners, however. Altered Clothing is easy to read and easy to follow, but in practice, it requires some knowledge of sewing, including using a machine, cutting cloth, and so on. If you've taken one or two sewing classes, that ought to be enough––but I'd hesitate if you didn't have at least that much experience. Every project comes with a "level of skill" from one to five stars. Most of these patterns are two stars, and take between seven and twenty steps to go from the "before" picture to the "after picture." This is why I recommend at least a beginner's grasp of sewing: if you don't like how the altered clothing looks in the "after" photo, you should be able to change a certain detail or two to make it look better. I would recommend this book to someone with a little skill in sewing, looking for an easy way to spice up their wardrobe. Kathleen Maggio is a good writer, and she's able to explain sewing in clear, precise language. Unfortunately, sewing is one of those disciplines where a specialized vocabulary is essential, especially as you increase in complexity. If you're just starting out in sewing, and have already made a couple of garments, I recommend reading this book as an introduction to altering clothes to make them fit and look better. Even if you're already a very experiences seamstress or seamstor, the book will probably give you some ideas for how you can spice up those clothes at the back of your closet, which you just can't bear to part with. Buy Altered Clothing on Amazon.com . This review is part of our Books section.